XAVIER: We’ve been given a second chance to define who we are. As I discussed in post #3, time is an ineluctable aspect of being human. We are forced to exist within its bounds, to live according to the pace that it sets. No one of us has ever escaped its grasp, though many have tried in a multitude of ways. In the age of industry and technology from the late eighteenth century through the present, we do this in part by telling stories about time travel. Precisely because time is an inescapable and central element of every human’s experience of reality, and because time cannot be controlled, time travel is an essential human desire. Narratives about time travel--at least, conscious time travel, in which the characters explicitly set out to visit the past or the future--have appeared in western popular culture at least since H. G. Wells’ 1895 novella The Time Machine, and have become a popular device recently in long-running franchises that encompass narratives told over many years and/or that have multiple versions. In this post, I identify three types of time-travel narratives based upon the effects that the time travelers in those stories have on the past and/or future. Examining these three types will give us insight into the different views on what time travel might do for the human experience. My identification of these three types is meant to be exploratory rather than exhaustive. Figure 1: We see Marty’s fingers become translucent as he begins to phase out of existence as a result of his mother and father growing further apart in the past in Back to the Future (Zemeckis 1985). Figure 2: At the beginning of the film Back to the Future (Zemeckis 1985), Biff bullied George about his office job and wrecked his car without apology, but at the end of the film Marty’s meddling in 1955 has made his father into a successful science-fiction author (left) and Biff into a subservient car waxer for the McFly family (right). In type #1, the past can be changed. One of the clearest examples is the Back to the Future series, especially the first installment. In that film (Zemeckis 1985), Marty McFly’s accidental time travel to 1955 causes his parents’ courtship to go off the rails. This nearly results in Marty’s erasure, as when at the “Enchantment Under the Sea” high school dance Marty is unable to play the guitar because he’s actually disappearing! (see figure 1). In the end, though, the McFly family’s future is secured by Marty’s encouragement of his father George to fight back against bullies like Biff. When Marty returns to 1985, his shaping of his father’s assertiveness has resulted in George becoming a successful author (“Like I always told you, if you put your mind to it, you can accomplish anything”) and in Biff being reduced to waxing the McFlys’ BMW (see figure 2). In type #1, then, time travel is a positive intervention that can make the present better. In type #2, the past can’t be altered. A haunting example of this is the final episodes of the television series Twin Peaks season 3. In the penultimate episode, “Part 17”, the protagonist of the series, FBI Agent Dale Cooper, attempts to prevent the murder that brought him to the town of Twin Peaks when the series first debuted in season 1 (1990). 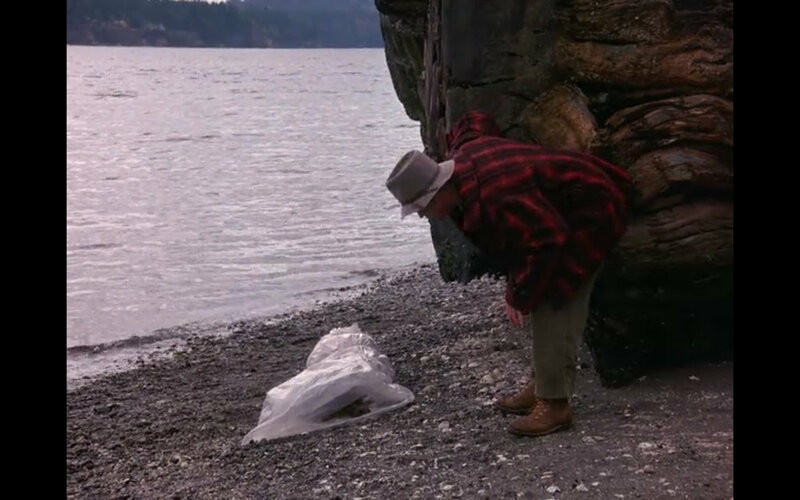 In the first episode of the first season, “Northwest Passage”, high school student Laura Palmer’s body is discovered wrapped in plastic on the shore by Twin Peaks resident Pete Martell (see figure 3), and FBI Special Agent Dale Cooper is assigned to the case. In the prequel film Twin Peaks: Fire Walk With Me (Lynch 1992) we see the events the night of Laura’s murder. After a tearful exchange with her boyfriend James, Laura runs into the woods to rendezvous with unsavory drug dealers, goes with them to a cabin, and is then kidnapped by her demon-possessed father and murdered. Figure 3: Pete Martell discovers Laura Palmer’s body in the opening scene of Twin Peaks season 1 episode 1. In “Part 17”, in 2017 Cooper is sent back in time to that fateful night. He stops Laura in the woods before she reaches the cabin and takes her by the hand. “Where are we going?” 1989 Laura asks. “We’re going home,” 2017 Cooper replies (see figure 4). It seems as if Cooper has saved Laura at this point, which is mirrored on the visual level by a switch from black-and-white photography to color. The next scene seems to indicate that 2017 Cooper has changed the timeline. Laura’s plastic-wrapped body flickers out of existence. Pete Martell goes out fishing in the morning, but unlike in season 1 episode 1, he doesn’t find a body and instead enjoys fishing from a pier (see figure 5). This change is short lived, however, when in the next scene we see Laura’s mother Sara in 2017 screaming as she destroys a frame that contains her daughter’s high-school photo. The scene switches back to the reimagined 1989: as Cooper and Laura begin to take a new path, Laura is suddenly snatched from Cooper’s grasp, and we hear her scream. Perhaps 2017 Cooper has prevented 1989 Laura from being murdered at that precise moment in the circumstances familiar from the film and TV series, but “Part 17” suggests that Laura is killed some other way (after all, I can’t imagine that the demon that possesses Leland would give up that easily). In any case, Cooper hasn’t prevented all of Laura’s trauma--her abuse at her father’s hands began several years before she was murdered according to Fire Walk With Me. 2017 Cooper attempts to right the wrong that was the primal scene for the series, but his failure to do so (along with the creepy Carrie Page storyline in “Part 18”) implies that history cannot be changed in a substantive way. Figure 5: Pete Martell fishes from a pier in Twin Peaks and does not discover Laura Palmer’s body in Twin Peaks season 3 episode 17, whereas he did in Twin Peaks season 1 episode 1. In type #3, the past can be changed, but another, unpredictable timeline results. This happens in the film X-Men: Days of Future Past (Singer 2014), which depicts the mutant Wolverine time-traveling from 2023 back to 1973 to stop an event that will lead to his dystopian future. Days is an inflection point for the X-Men series of films that have been produced since the first year of the twenty-first century: X-Men (Singer 2000), X-Men United (Singer 2003), X-Men 3 (Ratner 2006), X-Men Origins: Wolverine (Hood 2009), and The Wolverine (Mangold 2013). These films featured the X-Men as adults, whereas a film that was released in 2011, X-Men: First Class (Vaughn 2011), depicted the origins of the team in 1962. Up until Days, all of these films ostensibly inhabited the same timeline, but after 2023 Wolverine’s time-traveling in Days, the “2000 universe” and the “2011 universe” become separate. In the end, 2023 Wolverine’s mission is successful, and he awakens in an ostensibly happy future, in which all (or at least most) of the X-Men from the 2000 universe are alive and teaching at Xavier’s school for mutants. Wolverine’s alteration of history, a “ripple” in time, will have unexpected consequences, however. Events in Days have diverged from events in the 2000 universe films, and so the future is more or less “unwritten” for the 2011 universe. It allows more X-Men films to be made chronicling the narrative time between 1973 and 2023: 2017’s X-Men: Apocalypse is one such example, and as I write Dark Phoenix will be released later this year (2019).